I am thrilled to be joining the main MFT design team as we share shaker card inspiration ALL week! And you know MFT doesn't celebrate without lots of prizes so be sure to visit the main MFT Blog to find out how you can win supplies to make your own shaker cards and to see the fantastic cards that the design team created! The theme of the first day is to share tips and tricks for making shaker cards and I have thought of a few that seem to help me when I create a shaker card. #2.) Start out with a small shape, such as a small circle, or square. As you get more confident in your shaker card skills you can increase your shaker space. #3.) Be sure to line the entire die-cut shape with foam. Any space left open will be a magnet for sequins and they will eventually fall out. Here is the shaker card I created just for today using the adorable new Birdie Brown You Gnome Me stamp set and matching die-namics. I had SO MUCH FUN creating this card! MFT Shaker Week will take place April 13-17 and I am sharing cards each day! Yay! Be sure to check back tomorrow, I have a card I can't wait to share. Have a great day and thank you for stopping by! Veronica, your card is simply adorable. Thank you for sharing your helpful tips. Would YOU like to know something different that I have used (in a child's card), in my shakers? Keep in mind it shows up best with a darker background scene. PASTA ALPHABETS! They are tiny and shake around great. You can even glue down the letters inside to spell their name and let the others flow inside freely! Really fun garden scene!! :) Love this cute idea! Teresa, alphabet pasta is a great idea! Thank you for sharing, and thank you for the sweet comment! Love the scene you created for your shaker. Congrat's on being part of the main MFT DT! How exciting!!! Love this HUGE shaker card with the adorable scene. So fun! Great tips. AWE this is soooo darn cute!!!! Great shaker card!!! Such a fun scene! Love this!!! This is really different--an entire shaker SCENE! This is really fantastic! Many great details on your shaker! Love this card, it tells the whole story! Love this card! The dimension on your project is SO awesome. 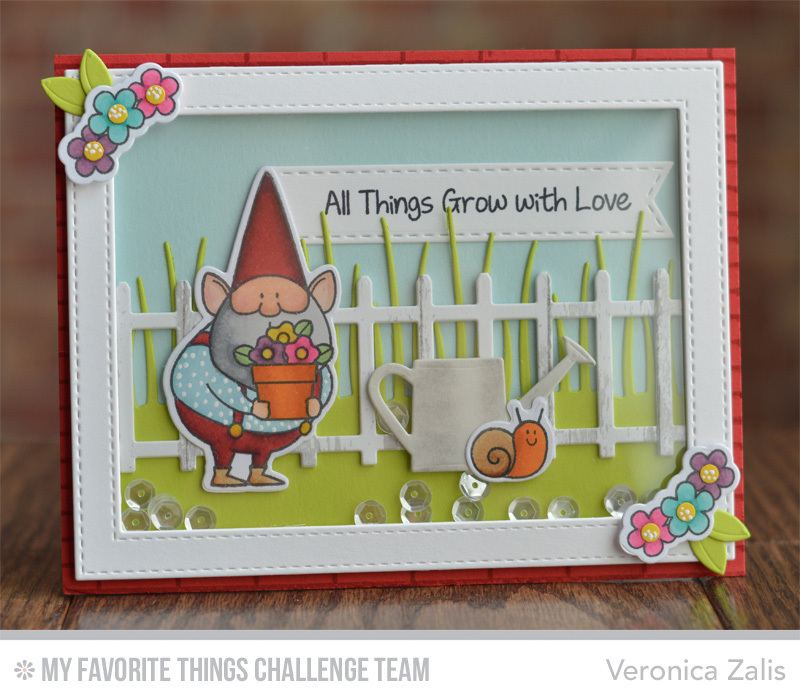 Veronica I love your gnome shaker, so cute! Love this card it is amazing. Awesome project. So perfect! I love this card and the wonderful scene that you created! Thanks so much for sharing!